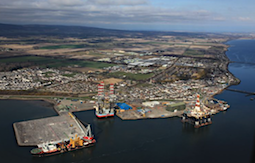 The Port of Cromarty Firth in Invergordon has announced a £30 million quayside expansion that will generate 140 new jobs across the Highlands and Islands. This follows the recent announcement of a £10 million contract from Moray East Offshore Windfarm to become the intermediate port for its 95-turbine development. The new 218m quayside and nine acres of laydown area has been designed as a new energy and cruise hub and will be completed by 2020. It will be able to accommodate large scale renewable, decommissioning and oil and gas projects, and will also be able to berth the largest cruise ships currently being designed and built. This will be the second quayside and laydown area built by the port in three years. In 2015-16, the port invested £25 million in a new 150m quayside and nine acre laydown area, which contributed to its most successful year in 2017. Bob Buskie, chief executive of the Port of Cromarty Firth, said: “This is tremendous news for the port and the Highlands and it represents a significant investment by the board. “As a Trust Port, all of our profits are reinvested in the port’s future development. “We believe this investment will be help bring new work to the area for decades to come. “This is already starting, with last week’s announcement of the Moray East Offshore Windfarm contract. “The team at the Port have been working for two years on this project and we couldn’t have done it without the help of the Scottish Government, Highlands & Islands Enterprise (HIE), Royal Bank of Scotland and, of course, our new partners Moray East. “There is a substantial demand for the services in the port and, even with the large new quayside and laydown area finished in 2016, we still experience capacity issues. HIE has approved £7.75 million grant funding to the project over the coming years. £2.3 million of this total is being contributed by the European Regional Development Fund (ERDF), and an application for a further £800,000 ERDF funding is under consideration. The HIE package also includes £2 million of additional funding from the Scottish Government.